Several neurological complications following wasp sting have been described. These complications can affect both central nervous system (like encephalitis, demyelinating syndromes, pseudotumor cerebri, and Parkinsonism More Details) and peripheral nervous system (like optic neuropathy, Guillain−Barré syndrome, and myasthenia gravis). Vascular complications involving cerebral and coronary vasculature have also been described. ,,,, We are reporting an unusual case where multiple vascular events occurred following a wasp sting. An 8-year-old boy presented with 7-days history of altered sensorium and weakness of right side of the body. His illness started 36 hours after a wasp sting. There was a history of wasp sting over left supraorbital area. Initially, only itchy and painful sensations were noted on the stung site. Later on there was marked localized swelling over left eye. On admission, his blood pressure was 128/63 mm Hg. Neurological examination revealed that the child was conscious. However, he was having motor aphasia. Cranial nerve examination revealed mild proptosis, complete external ophthalmoplegia, ptosis and dilated and fixed pupil on left side. His vision was normal. There was right upper motor neuron facial palsy. Motor examination revealed right sided hemiplegia (power of medical research council grade 0/5 on right side, hyperreflexia, and right extensor plantar). There was no carotid or orbital bruit. Other systemic examination was normal. Investigations revealed hemoglobin of 10 g/dL and total leukocytes count of 7600/cmm. Differential leukocytes count revealed polymorphs-65% and lymphocytes35%. Platelets count was 1,62,000 platelets per microliter. Prothrombin time and activated partial thromboplastin time were 16 seconds and 24 seconds, respectively. Fasting blood sugar was 82 mg/dL. Renal and liver function tests were normal. Serologic tests for antinuclear antibody, human immunodeficiency virus and syphilis were negative. Thrombophilic profile, including antiphospholipid antibody, lupus anticoagulant, antithrombin-III level, was negative. Electrocardiography, echocardiography, and chest X-ray were normal. Cranial computed tomography revealed a non-hemorrhagic infarct in the left medial frontal lobe. Magnetic resonance imaging including T1-weighted, T2-weighted, T2-FLAIR, and diffusion-weighted images showed infarct in left fronto-temporal region extending into lentiform nucleus and right medial frontal lobe [Figure 1]. 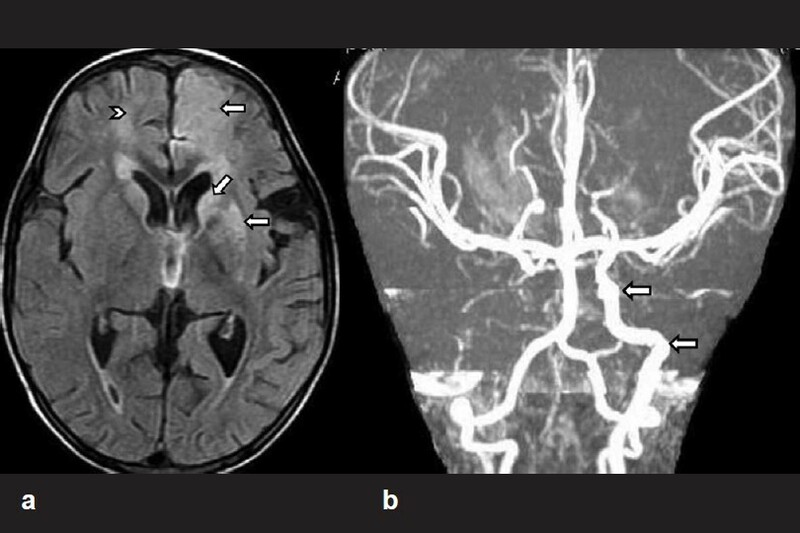 In magnetic resonance angiography, left internal carotid artery was not visualized. Bilateral anterior cerebral artery and middle cerebral artery were visualized normally. Neuroimaging was suggestive of left cavernous sinus thrombophlebitis. Patient was treated with oral anticoagulants and other supportive drugs. After one month of follow-up patient improved remarkably. He needed minimal support for all his daily needs. Ocular signs had disappeared. Figure 1: Magnetic resonance imaging T2 FLAIR image (a) showing an infarct in left frontoparietal region with involvement of left caudate and lentiform nuclei (arrows). An infarct of right medial frontal lobe was also seen (arrowhead). Magnetic resonance angiography (b) showing total occlusion of cervical part of left internal carotid artery. Right internal carotid artery is normally visualized (arrows). 1. Sachdev A, Mahapatra M, D'Cruz S, Kumar A, Singh R, Lehl SS. Wasp sting induced neurological manifestations. Neurol India 2002;50:319-21. 2. Rekik S, Andrieu S, Aboukhoudir F, Barnay P, Quaino G, Pansieri M, et al. ST elevation myocardial infarction with no structural lesions after a wasp sting. J Emerg Med 2009. [In press]. 3. Roy M, Chatterjee M, Deb S, Pandit N. Encephalitis following wasp sting. Indian J Pediatr 2010;77:1193-4. 4. Chen DM, Lee PT, Chou KJ, Fang HC, Chung HM, Chen DM, et al. Descending aortic thrombosis and cerebral infarction after massive wasp stings. Am J Med 2004;116:567-9. 5. Vidhate MR, Sharma P, Verma R, Yadav R. Bilateral cavernous sinus syndrome and bilateral cerebral infarcts: A rare combination after wasp sting. J Neurol Sci 2011;301:104-6. 6. Crawley F, Schon F, Brown MM. Cerebral infarction: A rare complication of wasp sting. J Neurol Neurosurg Psychiatry 1999;66:550-1.